This poster announces Osborne's Big Frontier Roundup at Osborne, Kansas, on July 14th, 15th and 16th, with no year given. The event was produced by the Cody Lake Roundup Company. 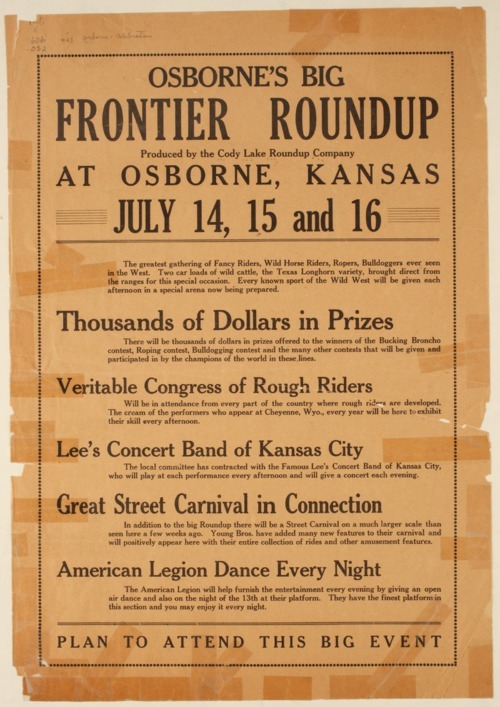 The poster advertises Thousands of Dollars in Prizes, Veritable Congress of Rough Riders, Lee's Concert Band of Kansas City, Great Street Carnival in Connection, and American Legion Dance Every Night were all part of this event.